Excellent Manifestation Tools That Embody Potent Energy! 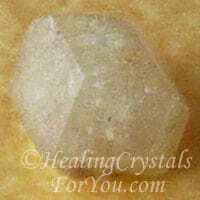 Rhodizite crystals are very small, on average only around three to four mm in size, but they have an amazing energy. The size is really unimportant as they have a powerful zingy energy that knocks your socks off! What I find amazing is the way they boost the energy of much bigger crystals when you use them with others that may not be as powerful. 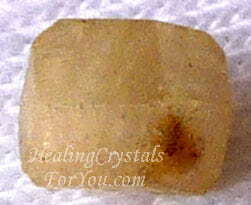 If you have a piece of another variety of crystal, that you love the energy of, but its just not working as quickly or as powerfully as you'd like, combine it with one of these tiny pieces of stone. Important Note: keep your thoughts positive as they magnify the vibrations of other crystals, and of the thoughts of those in their environment. You will get what you are concentrating on, as they are the Law Of Attraction in action. These tiny stones are a beryllium aluminum borate crystal that occurs in a feldspar matrix, and is often found in the same areas as Elbaite Tourmaline. Their shape is commonly a rhombic dodecahedron or trigonal, though some are a little misshapen. Handle them with care, as one of mine cracked in half when I squeezed it too hard between my fingers. Most of these now come from Madagascar although they were originally found in the Ural Mountains in Russia. They have also since been found in England and Wisconsin in the USA. The color of these tiny crystals are usually either yellow, grayish, white or colorless, and you can sometimes get them in their matrix, like the one below, but this may be less common. Their size ranges from very tiny, like the ones in the matrix, through to quite small, but big enough to handle. I bought just one small crystal at first, but once I discovered their energy I bought another six online. They come in a range of sizes, and I suggest you buy the biggest that you can find, as the biggest ones may still be quite small. They are not common, and are sometimes labeled as rare, but you can probably get them reasonably easily, and they are not expensive. Often they are sold in groups of three as this is how they are recommended to be used when keeping them on the body. 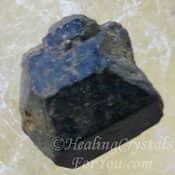 When you use a Rhodizite crystal at the third eye chakra you can quite easily feel the energy resonating there, and you can feel it working within the brain in a number of places. 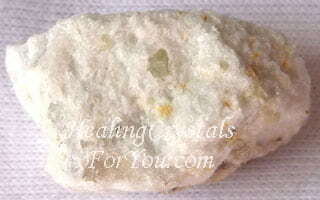 It may be similar to Golden Herderite or White Heulandite, which opens new pathways in the brain. Many people can also feel their energy working within the crown chakra. 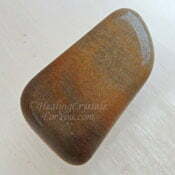 Like many of the high vibration stones with a high level of crystal energy, they have a quite easily felt vibration. 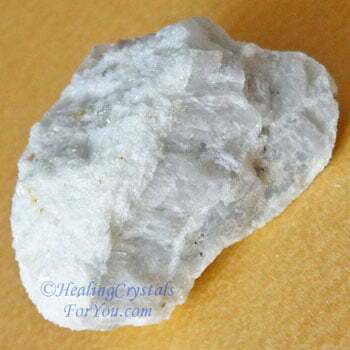 Using your piece of Rhodizite in meditation is a powerful way to use it. 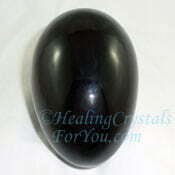 Used at the higher chakras, it may help to enhance your psychic gifts. During meditation with them, you may discover more about past lives, or possible future lives, without feeling emotionally involved. As well it may open up your ability to see into the etheric body, also known as having medical intuitive abilities. This may help you to discover the illnesses that are there, and that may have already come into your physicality, or may be on the way to manifesting in your body soon. 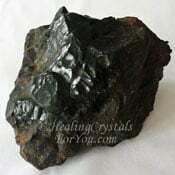 Rhodizite crystals are excellent combined with any other stone at all, as they will boost the energy of the second stone. So if you wish to manifest change of any type in your life, you may combine them with other stones that are known to aid you to change your life. As well if you'd like to enhance any gifts you already have, combine them with others that stimulate these gifts. If you would like to lucid dream, or just remember your dreams better, this is another benefit of using them. Their energy may help you to achieve whatever it is that you desire to have occur in your life. 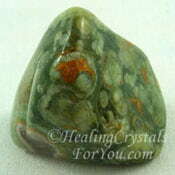 So it is important to stay focused on what you desire when you are using a piece of Rhodizite, and to be positive. To assist your understanding of manifestation, read some of the Law of Attraction Books including the powerful Abraham Hicks books. 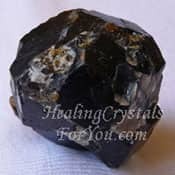 These crystals are typically quite small, but size in this case is not an issue, as they embody a powerful energy and have many impressive metaphysical properties. Even the bigger pieces may be classified as tiny, and yet when you hold one between your fingers, you can easily feel a pleasant zing of energy. Their vibration can be felt very easily by most people, and their vibration may cause a flash of heat to go through your body. 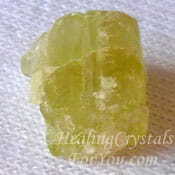 They have a strong resonance, and you may clearly feel it at the solar plexus or power chakra. This energy is known to be especially helpful to boost the strength of your will, and it may aid you to develop stronger will-power. As this chakra is also related to manifestation, this is why they are an excellent help to boost abundance and prosperity in your life. 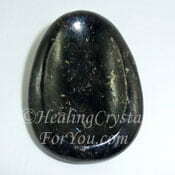 They are also powerful stones to use to aid you to develop your psychic gifts, and their energy is known to be very powerful to awaken many psychic powers. This includes telepathic abilities, distance viewing, psychic visions and clairvoyant gifts, and maybe other psychic abilities. Personally, my clairaudient abilities come to life when using them, and my connection to my guides is also elevated by their vibration. 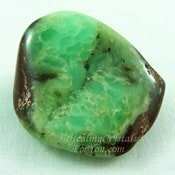 This is a stone that has no negativity within its vibration, nor is it even neutral, but has an unquestionably powerful positive resonance. 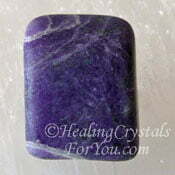 They will magnify the energy of any other pieces you use with them, as well as magnifying what you think about. 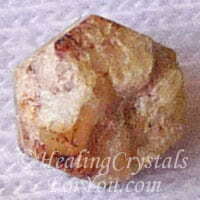 From the beginning I bought these stones in groups of three, as I had read that they work well used in this way. 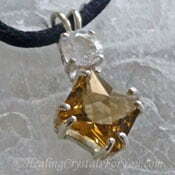 You may choose to wear a group of three of them at the solar plexus, as this can aid its action. 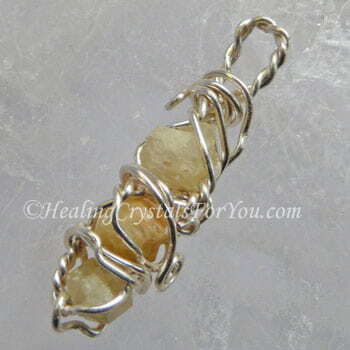 A wired Rhodizite pendant, like the one shown here, is a wonderful way to wear the energy on your body. If you wish to wear them this way, there are a couple of different ways to do this. Before I found the pendant, I started by using them in a tiny gauze bag, and this was inside a slightly bigger cloth bag. I did it this way firstly because they are so tiny they might slip out, and secondly so that I can also place other crystals with them in the second bag, knowing they will be safe from getting lost. 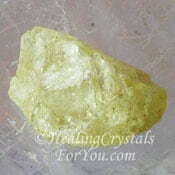 I often use Brazilianite with mine, but its easy to change what is being combined with them. They do need to be touching the other stone to boost its power. As the best place to wear them is around the area of your solar plexus chakra, a pendant on a long chain would be ideal. 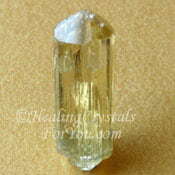 Rhodizite stones are quite tiny, so they could be easily incorporated into jewelry. 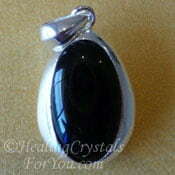 You may be able to find pendants made from them like the one shown, or sometimes just one stone combined with another crystal. 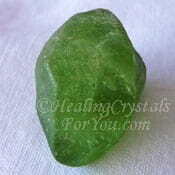 If you are feeling anxious or stressed, depressed or down in any way, this crystal has an energy that will boost you emotionally, and help you to feel more optimistic about the circumstances in your life. To boost its energy even more, to change any negative feelings you may have, combine it with stones that bring joy, happiness and an elevation of your spirits. Crystals that you could use with it to bring you to a better feeling place, might be stones that elevate feelings of joy and happiness. 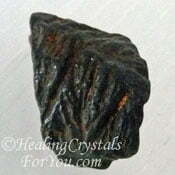 Any of the stones in my article on methods to ease stress would work well with these stones. Good choices to use with it includes crystals like Dalmation Jasper, Aegirine, Rainforest Jasper, Kunzite, Green Tourmaline, Pink Tourmaline, Chrysoprase, Amblygonite or Lilac Lepidolite. 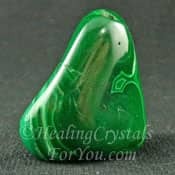 Rhodizite will magnify what you are currently feeling, so it is best to get your feelings up to a more positive state before attempting to use it to manifest major changes in your life. These crystals are tiny, with most being about 3 to 4 mm in size. The size is really unimportant as they have a quite potent energy. They boost the effect of any other crystal, so if you have a piece of another type of stone, that you haven't found to be working effectively, use it with one of these little stones. Remember: keep your thoughts positive as they magnify the vibrations of both other crystals, and of the thoughts of the people nearby. Be aware that you may get what you are thinking about, as they are the Law Of Attraction in action. If you are not familiar with the Law of Attraction and have not heard about how it works, checkout my article on the seven laws of attraction. The vibration of these stones are stupendous for such tiny stones. It is valuable to concentrate on positive thoughts when using them, and to keep your thoughts on message, so to speak. 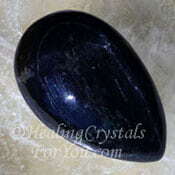 These stones may help to activate your third eye, and may also fully open up psychic abilities, such as psychic visions, channeling or distance viewing. 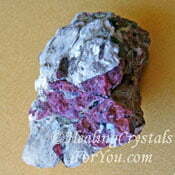 Rhodozite is helpful to aid your body to heal from a number of health issues. They are a good aid for mood related problems, including for depression and anxiety, and may boost how you feel, as their vibration can help you emotionally. 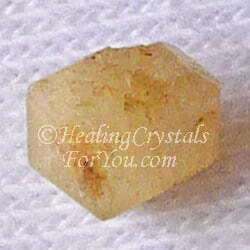 This crystal is said to be a natural orgone generator. It is known that a lack of orgone can cause you to get sick, so improving its level naturally by using this stone may improve your health. 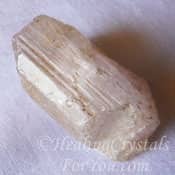 This crystal is also said to aid the healing of headaches, especially ones related to liver problems, and to help the health of the eyes. As well its action in the area of the brain is said to aid the healing of issues related to strokes and tumors. It may be beneficial to use it as part of any healing wand you may create, as it is known to aid healers to direct the healing energy to the right place in the body. 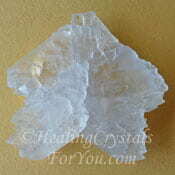 It is also said to be a comforting crystal for anyone who is terminally ill to use. It may assist them to make a deeper spiritual connection and to make peace with both themselves and Spirit before they pass over. "You are a creator, you create with your every thought. You often create by default, for you are getting what you are giving your attention to, wanted or unwanted. But you know by how it feels, if what you are getting or creating is what you are wanting or if it is not what you are wanting. Where is your attention focused?" 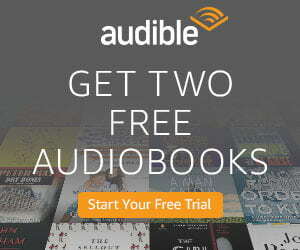 Abraham Hicks. 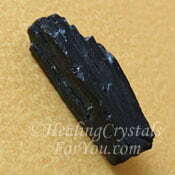 In a general way, there are quite a few crystals that you can use to aid you to make changes in your life. 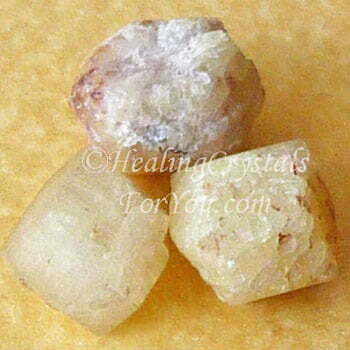 They may work differently to each other as different types of change are specific to particular crystals. Therefore if a stone listed below has an article already written about it, read it and see if you'd like to boost its vibration. 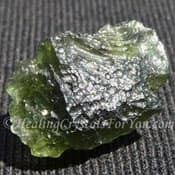 A well known member of this group is Moldavite, which is powerful to aid you to transform your life. Others that you may like to use include Stellerite, Spurrite, also known as Strombolite, Malachite, Selenite and Astrophyllite. 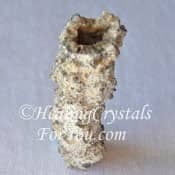 Novaculite is powerful combined with it as it boosts the action of Novaculite to attract and manifest those things you desire and also helps to sever karmic ties. 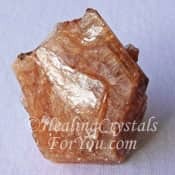 To specifically manifest abundance and prosperity and to manifest money in particular, you may like to combine your Rhodozite stone with manifestation crystals. My favorite combination for this, and one I have been using with great results is Citrine, Brazilianite and Green Peridot, as Peridot embodies the frequency of increase. 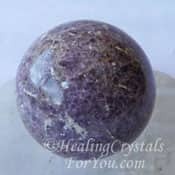 You could use them with stones to enhance your creativity or ones that stimulate any of the psychic gifts, or for helping to boost coincidence or synchronicity occurring in your life. 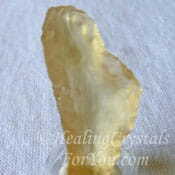 Other stones you could also use may includes Golden Yellow Topaz, Yellow Apatite, Libyan Desert Glass or Fulgurite, which has a powerful energy in its own right to manifest. 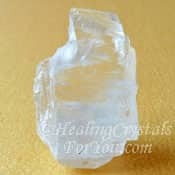 To strengthen the development of the gift of mental telepathy, you may choose to combine this crystal with stones that help you to develop this capacity. 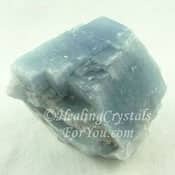 Crystals such as Natrolite, Phenacite, Selenite, Blue Kyanite, Ulexite, Muscovite, Petalite, Blue Calcite and Eudialyte. Be aware that these stones are very high vibration, so if you are using them, you may benefit by using strong spiritual grounding stones in combination with them. If you are not sure if you are grounded check out this information... Are you ungrounded? Grounding crystals may also help to better ground the effect of these crystals into your reality, bringing your lightbody fully into resonance with your physical body. 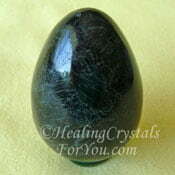 It is helpful to use some of the grounding stones for this purpose. 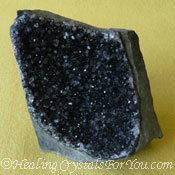 Rhodizite Crystals Embody Potent Energy!